APA Management Group, Australia’s largest energy infrastructure business, services 15,000 kilometers of natural gas pipelines across mainland Australia, managing a portfolio of energy assets in excess of $20 billion, and delivers half the nation’s natural gas usage. APA’s South Australian branch at Kidman Park were keen to know how they could deliver more energy efficient internal operations, and so engaged the services of Tandem Energy to provide a level 2 Energy Audit in mid-2017. The facility plays host to both a workshop, for repairing and maintaining the pipe-lines, and a two-level office building in which the monitoring of assets takes place. The focus of the business has shifted towards monitoring, with the majority of energy being consumed by the office building. While lighting and IT consume a large portion of the total energy consumption, mechanical services, (heating, cooling and ventilation (HVAC)), is the biggest consumer. With numerous HVAC units located across the site, good control over this area is vital, and was the main focus of the energy audit undertaken by Tandem. 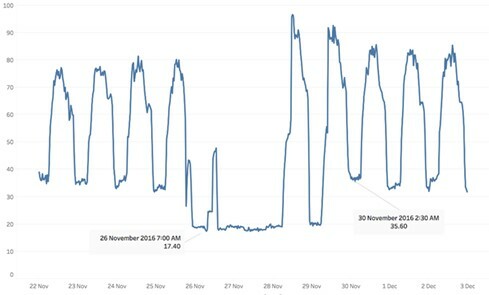 The old adage, “you can’t manage what you can’t measure” is most certainly the case when it comes to energy auditing, and one of the best tools to measure energy use is a data logger. Though not stipulated as part of a type 2 energy audit, data logging gives the clearest picture as to what is really going on behind those walls (and ceilings). In total, 7 data loggers were installed across the workshop and office area, with notable results. APA Group employs over 1,600 people nationally, and own and operate one of the largest interconnected gas networks across Australia. APA’s focus on energy efficiency reaches beyond the field and into their internal operations. Tandem Energy were engaged to audit the Kidman Park office and workshop, discovering a 20% reduction in potential energy savings. Though not stipulated as part of a type 2 energy audit, data logging gives the clearest picture as to what is really going on behind those walls (and ceilings). One of the most interesting (and most puzzling) results of the data logging was that of a load which appeared to perform outside of its usual pattern. Each load has a baseline, which can be as low as zero if completely shut down at end of day, however many have a minimum that is constantly maintained. So, when a load that typically maintains at 18kW suddenly drops to zero, it raises some questions. Tandem’s investigation discovered that one of the air-conditioning units had “gone rogue”. Instead of turning off at the required time each night, it was in operation more than required, costing the business a significant amount more in electricity costs. Despite regular servicing and maintenance, this air-conditioning load ran undetected sporadically over a couple of years and would have continued to do so without intervention. Identification and implementation of a timer (integration into BMS unit) on the air conditioners was recommended and would stand to save APA a significant amount on their electricity bills. In addition to reducing HVAC energy consumption, potential savings were also identified through lighting upgrades, improved Building Management System controls, installation of Power Factor Correction, and staff behavioural changes. Detailed analysis of your business through regular auditing can save your business thousands of dollars – with little to no investment in capital. Talk to Tandem Energy to find out more.